This flavorful Sri Lankan style soup is best prepared in a slow cooker (crock pot). We also prefer starting our cooking in the evening and letting the beans cook over night on medium heat. 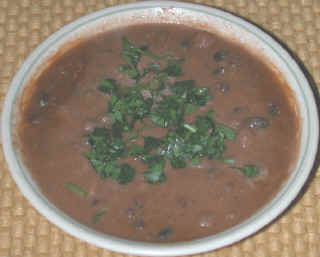 By beginning the cooking process in the evening, the soup can be ready for the next day's lunch. Thoroughly wash and clean the mixed beans and place then in the crock pot, set on medium heat, containing 6 cups of boiling water (never use hot tap water - always start with cold water to avoid heavy metals that may be dissolved in the hot tap water). Let cook over night or for about 8 hours. In a high speed blender, add the cleaned and peeled onion, garlic, carrots, fennel seed, coconut and 1/2 cup of cold water. Blend at high speed until smooth. Add the ingredients to the crock pot and set the heat to "high". Wash out the blender with another 1/2 cup of water and add to the crock pot. Add the remaining ingredients to the crock pot and mix thoroughly. Cook for another 4 or more hours. Mix occasionally and add additional water as desired to have the desired consistency. We prefer to have the soup thick. Serve with a sprinkle of chopped parsley (optional). This soup makes a great meal when served with a salad.